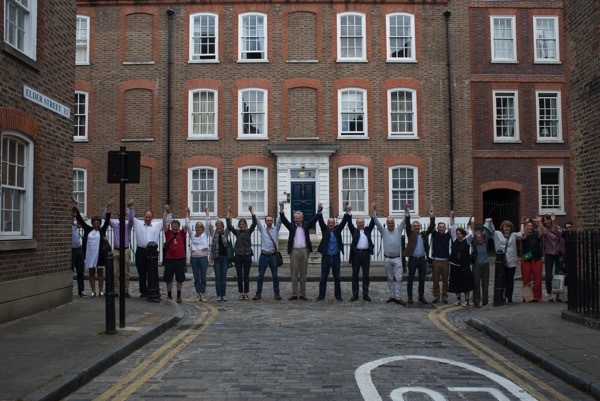 PLEASE COME AND JOIN HANDS WITH ME to create a circle around Norton Folgate as a symbolic gesture of our shared wish to see these buildings restored for new use instead of being demolished by British Land. 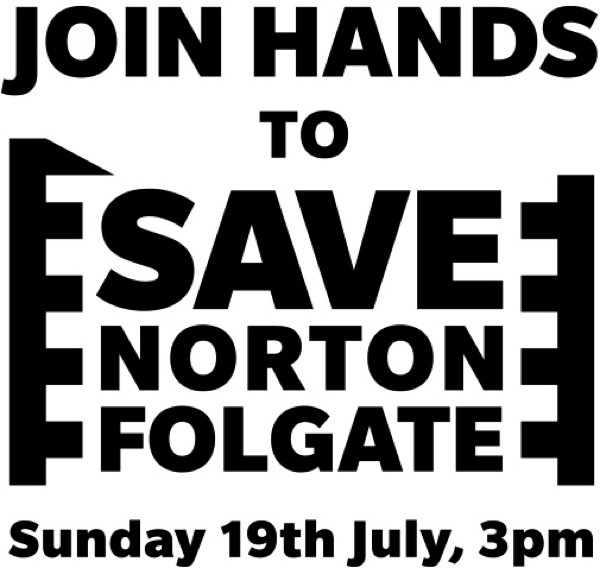 Three days before Tower Hamlets Planning Committee meet to decide the fate of Norton Folgate on July 21st, we want to show that large numbers of people care sufficiently to turn up and create a human chain around this historic neighbourhood. We hope this event will be a focus for everyone who believes old buildings should be repurposed rather than destroyed, as is happening across London at this moment. 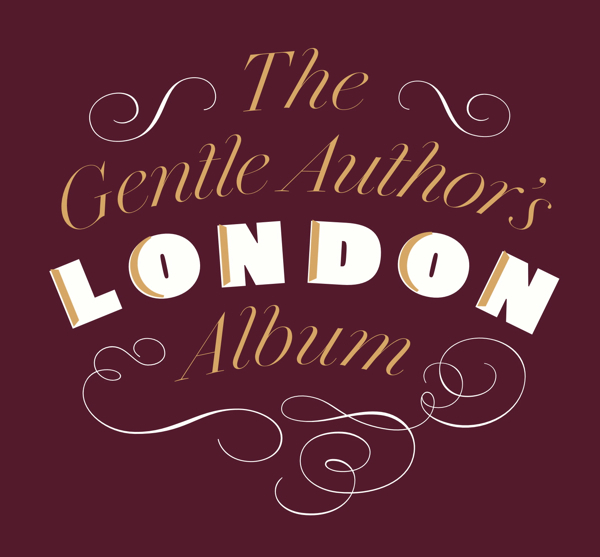 As you know, this is a subject close to my heart and so, as a gesture of gratitude to those who are willing to join hands with me on 19th July, I will give a copy of THE GENTLE AUTHOR’S LONDON ALBUM as a gift to the first five hundred people to turn up. Afterwards, I shall be swapping the five hundred numbered tickets for copies of THE LONDON ALBUM and the event will be dispersed by 3:30pm. If you care about the future of Spitalfields, if you care about the future of East End, if you care about the future of London, come to join hands in this historic event and bring your family, your friends and neighbours – and please spread the word. I hope this gets the attention of the council. This is yet another appalling attempt by some to erase anything from the past, anything of old London. Anyone that would want to destroy such lovely old buildings full of character for cold, soulless, modern monstrosities must be mad. Just looking at both types of buildings in this video, there is no comparison as to which ones are good and which ones are utter eyesores. I do so hope this can be stopped, again. Raise a couple of arms for me! I hope many, many people will turn up & you receive much media coverage – it’s a wonderful idea. Yes x 3 and more if I can. Until July 19. A brilliant happening and I look forward to being there. I’ll be there in spirit. Good luck! I am reading Robert Ludlum’s ‘The Sigma Protocol’ written in 2001. How it rings a booming great bell now. Evil conspiracies controlling London. I hope when I read to the end that the ‘hero’ and his girl will have overcome. And I so hope that the ‘heroes’ there on that Sunday will also overcome. hop into my car; hop onto the ferry and drive up to London to “JOIN HANDS”. should this disasterous project go ahead. I AM WITH YOU IN MY HEART and SOUL and in SPIRIT. Boy am I with YOU. I will be there to hold it tight! I am not English and I live in the States. I can claim no personal history to this area. This being said, I love London, I think it is the best city in the world. As you gather together, you will also be standing for people like me who feel that these historic buildings and these historic places in the East End of London, are vital to maintaining the rich historical fabric of London, and to the world. I too am with you in spirit. Gutted about our history going by the wayside. I will be thinking of you at this time. Shame I live so far away in Devon. I am sending you a virtual pair of hands with which to slap the faces of those who seek to destroy everything and anything that has memory or meaning to us. The only saving grace is, that unlike Sir Christopher Wren et al…. Most of these modern designers, builders, architects and money grabbers will die unknown and unlamented. I don’t live in London either but the campaign has my full support and I have shared the link to the blog in the hope of more people getting behind it. I fear that the tone of this proposed development – the lack of sensitivity to local history, scale of building and architecture, geography and disregard of the actual people living in the community – is running throughout the country. If only there was a way to teleport myself from New York to London to join the circle around this treasured place. If possible, could a small piece of rope, or some other item, with my name attached and held at either end by two people within the circle, suffice? It would be an honor to be a part of this event. Doing everything i can to re-arrange my day so that i can get there. I would be there if I could but I live in north Wales. I have never been to Spitalfields but am fascinated by it and will come sometime. Meanwhile yes, I am with you in this; such destruction should not be allowed to happen. I wish I could have been with you to hold hands but I live in France. I visited Folgate last year and thought it was wonderful. This development CANNOT be allowed we must preserve our history. Why would anyone want to destroy such an historic and interesting part of our amazing capital city? Not everything old is bad, not everything new is good. This can’t happen, I’m sorry I could not come to London on 19th. Great praise to all and I hope campaign successful. Why tear down and not work instead with what is there and leave areas of character. The huguenots were folk keen to preserve skills and gave so much to our arts and culture. My own family of huguenot forebears ended up in Ireland and gave me pride in my heritage . It is a shame that developers cannot see beyond to future generations who will be reversing their so called improvements.